What is the Hughes Scholarship? The Hughes Scholarship is part of the Hughes Initiative for Pastoral Excellence. The goal of the Hughes Scholarship is to gather and help prepare the most promising of those called to pastoral ministry. Through an education designed to shape both mind and character, this scholarship will enable life-on-life training to equip the next generation for Gospel ministry in the Church. in a local church context. In November 1951, Dudley J. Hughes married Robbie Watson. Shortly afterward, he was called to active duty and was awarded a Bronze Star for his service in the U.S. Army during the Korean War. Returning home, he had a distinguished 40-year career in exploration geology in the oil industry. As devout Christians, they loved each other and their family well and served their Lord together for nearly 64 years until Dudley was called home on April 21, 2015. Since childhood, Robbie has been conscientiously committed to loving and serving her Lord and Savior, Jesus Christ. When she was 19 years old, she began to teach Sunday School and has been active in Christian service through her church and beyond ever since. She started a Bible study at their family fishing camp in Canada for their friends and neighbors and has personally provided Bibles for scores of people who were new to the Christian faith. She has prayed diligently for family and friends that they might grow to know her Savior the way she knows Him in a daily, personal walk. Robbie’s life has been characterized by seeking to know God and making Him known. 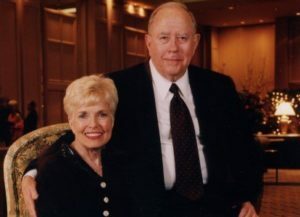 Robbie and Dudley believed from the beginning of their marriage that they were called to be good stewards before God of their lives and resources. Both of them have been committed to giving back generously from the abundance God entrusted to them through their success in business. As a result, many, many lives have been impacted for eternal good through the gracious support given through the years by the Hughes. The Hughes’ life-long commitment to serve Christ and make an impact for eternity has led Robbie to create and endow the Hughes Initiative for Pastoral Excellence at Reformed Theological Seminary. RTS is honored to be entrusted to provide the training that will be made possible by their generosity. Apply for admission to the MDiv program at one of the following campuses: Jackson, Orlando, Charlotte, Washington D. C., Atlanta, Houston, or Dallas. Complete the financial aid application. Indicate your interest in the Hughes Scholarship, and submit the requested supporting documentation. If you are a finalist for the scholarship, the financial aid office will contact you to schedule an interview with the scholarship committee. Can current RTS students apply for the Hughes Scholarship? The Hughes Scholarship is only for incoming prospective students. However, we do allow winter/spring starts to apply for the Hughes since they would have missed the opportunity to apply the previous spring. Can I apply for financial aid even though I haven't been accepted as a student? Applicants must be admitted into the MDiv program before applying for financial aid. Are international students eligible for the Hughes Scholarship? To apply for the Hughes Scholarship, you must be a U.S. citizen. Is the Hughes only for MDiv students? The Hughes Scholarship is only for incoming Master of Divinity students. The goal of the Hughes Scholarship is to gather and help prepare the most promising of those called to pastoral ministry. We genuinely believe this is best accomplished through the Master of Divinity degree program. I'm not sure I meet all of the qualifications listed above. Should I still apply? Absolutely! We’d also encourage you to speak with an admissions counselor. They will walk with you every step of the way to help you make a decision that’s right for you. The deadline is March 15th. But don’t wait until then to start the process. If you haven’t been admitted as a MDiv student the entire process could take 1-2 weeks, depending on the campus. If the March 15th deadline is near, contact an admissions director right away and we’ll do our best to help.